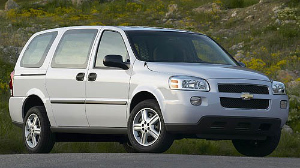 Difference between revisions of "Chevrolet Uplander"
'''Chevrolet Uplander. 2005–9 (prod. n/a). 5-door MPV, 5-door LWB MPV. F/F, F/A, 3498, 3880 cm³ (V6 OHV).''' The most commonplace of GM’s facelifted U-body minivans, with a more truck-like grille to appeal to male buyers. Given the dated origins, never up with the competition dynamically or in safety, and ran till the 2008 model year in the home market, and 2009 for Canada and México. Useful storage and good performance from larger V6. Followed the changes of its stablemates, the [[Buick Terraza]], [[Saturn Relay]] and [[Pontiac Montana SV6]], with larger engine from 2006, smaller one dropped 2007. '''Chevrolet Uplander. 2005–9 (prod. n/a). 5-door MPV, 5-door LWB MPV. F/F, F/A, 3498, 3880 cm³ (V6 OHV).''' The most commonplace of GM’s facelifted U-body minivans, with a more truck-like grille to appeal to male buyers. Given the dated origins, never up with the competition dynamically or in safety, and ran till the 2008 model year in the home market, and 2009 for Canada and México. Useful storage and good performance from larger V6. Followed the changes of its stablemates, the [[Buick Terraza]], [[Saturn Relay]] and [[Pontiac Montana SV6]], with larger engine from 2006, smaller one dropped 2007 along with the AWD option. Chevrolet Uplander. 2005–9 (prod. n/a). 5-door MPV, 5-door LWB MPV. F/F, F/A, 3498, 3880 cm³ (V6 OHV). The most commonplace of GM’s facelifted U-body minivans, with a more truck-like grille to appeal to male buyers. Given the dated origins, never up with the competition dynamically or in safety, and ran till the 2008 model year in the home market, and 2009 for Canada and México. Useful storage and good performance from larger V6. Followed the changes of its stablemates, the Buick Terraza, Saturn Relay and Pontiac Montana SV6, with larger engine from 2006, smaller one dropped 2007 along with the AWD option.